The Bay Area Rapid Transit strike will affect more than 400,000 riders on the nation's fifth-largest rail system. OAKLAND, Calif. — Commuters braced for traffic snarls Monday morning as two of San Francisco Bay Area Rapid Transit’s largest unions went on strike, halting train service for the first time in 16 years. The walkout promised to derail the more than 400,000 riders who use the nation’s fifth-largest rail system and affect every mode of transportation. Transportation officials say another 60,000 vehicles could be on the road, clogging highways and bridges throughout the Bay Area. The strike was called after an 11th-hour effort to resume negotiation failed to produce a new contract by the deadline of midnight Sunday. Both the unions and management said they were far apart on key sticking points including salary, pensions, health care and safety. “A strike is always the last resort and we have done everything in our power to avoid it,” said Josie Mooney, a negotiator for Service Employees International Union Local 1021. “Our members aren’t interested in disrupting the Bay Area, but management has put us in a position where we have no choice,” said Antonette Bryant, president of Amalgamated Transit Union Local 1555. Negotiations fell apart Saturday and the unions walked away from the table. California Gov. Jerry Brown’s office had urged both sides to resume discussions Sunday with rush hour on the horizon. BART spokesman Rick Rice said the agency had up its original offer of a 4 percent pay rise over the next four years to 8 percent. The proposed salary increase is on top of a 1 percent raise employees were scheduled to receive Monday, Rice added. 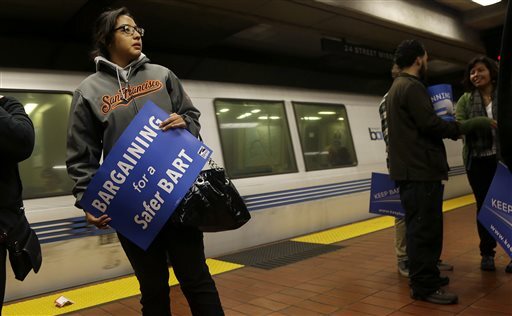 BART’s last strike lasted six days in 1997. The transit agency handles more than 40 percent of commuters coming from the East Bay to San Francisco with the Bay Bridge handling another 50 percent said John Goodwin, a spokesman for the Metropolitan Transportation Commission. Other transit agencies in the region urged commuters to consider carpooling, taking buses or ferries, working from home and, if they must drive to work, to leave earlier or even later than usual. San Francisco Mayor Ed Lee said the city will offer increased transportation options, including at the airport, and increase staff for traffic management. BART said it will let commuters use parking lots at their 33 stations free of charge for the purpose of carpooling.